Will Apple's new iPad support Adobe Flash when it ships in March? Not if you trust Steve Jobs' much-picked-over presentation in San Francisco on Wednesday - or the current EULA attached to the device's beta SDK. But for some reason, the marketing materials on the Apple website tell a different story. 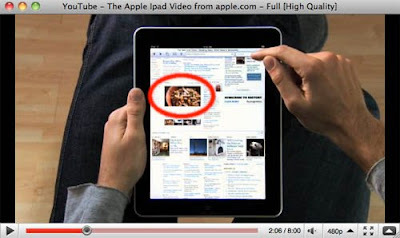 If you watch Apple's promo video - available either here (Apple) or here (YouTube), depending on whether you want to register your precious click in Cupertino or Mountain View - you'll notice that the iPad is displaying Flash content in a New York Times story. We highly doubt the Apple video is displaying some sort of top-secret HTML5-enabled NYT page that was unavailable for Jobs to use during his demo. Either Apple has Flash running on its tablet or someone in Apple marketing didn't want to display NYT pages without colorful slideshows and had the video mocked up to look like a Flash browser. In a blog post earlier this week Adobe's Adrian Ludwig barked that if you want to view one of the millions of web sites that use Flash on your iPad, you'll be "out of luck," citing images from Apple's iPad launch event. 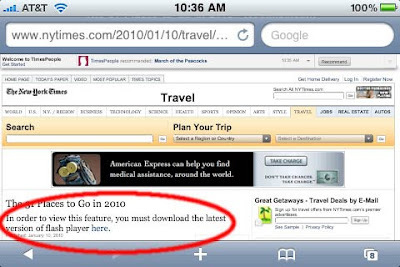 If you were one of the few who attended the iPad's roll-out on Wednesday in San Francisco, you would have witnessed Flash content in an NYT demo not appearing when Steve Jobs scrolled through a Flash-enabled page. Apple does not allow Flash on the iPhone, and iPad apps will share the same SDK. On Wednesday, Apple released a beta incarnation of the iPhone SDK - version 3.2 - that adds certain support for the iPad. As of Friday morning, Apple's iPhone Developer Program License Agreement (PDF) still says the platform can't run interpreted code, which includes Flash.